Ello ello! You might remember these freehanded letters from back in June. I created this design in June because I was invited to showcase my nails at an art show! 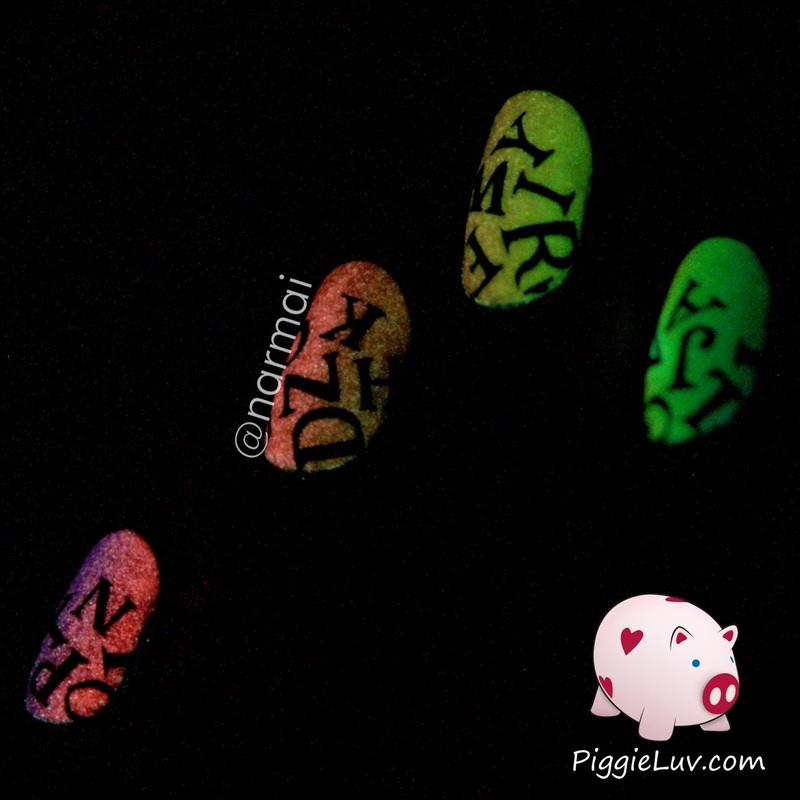 But I wasn't happy with the way my old pictures looked, so that's why I decided to recreate it and take better pics (and use lots of glow in the dark nail polish ofcourse). The art show was this afternoon and everyone was SO nice! I got a lot of compliments about it being so different, not being on a regular canvas. I met some truly amazing artists and even saw some familiar faces, so I had a great time :D Now click, come see the glow pics! I started out with OPI Alpine snow for the base because I like to have a white base under certain glow polishes. 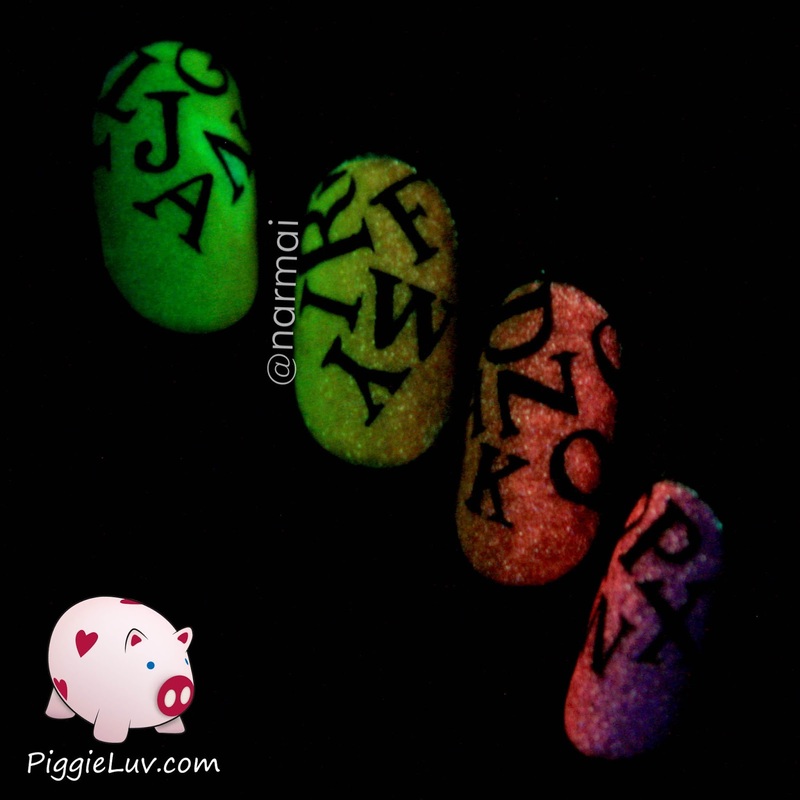 I made the gradient using Parrot Polish Glow Hot Lips, Glow Tonic, Glow Mr. Yuk & Glow Blaze. These are all jellies (which makes the glow really bright!) so the white base was definitely useful. I also used Serum No. 5 Ultra Violet or the purple on the pinkie to complete the look! The only way for me to do a gradient now, is to make it glow. And I gotta say, I did a pretty nice job on this picture! I know everybody's going to think this stuff was stamped, but it really wasn't (which is why I *tried* to record a video tutorial). I used my Basic One Gold detail brush from Christrio Scotland which is really the perfect brush for this kind of work. It's a thicker brush than you would normally use for detailed art, but it has a sharp tip which is great for tiny lines. But when you put more paint on the tip, and apply a bit of pressure, it makes thicker lines. So you only need one brush for a wide range of art! I'll talk you through this tutorial, so you'll easily be able to recreate it. First, apply your base color and let it dry thoroughly. Tape off your cuticles to minimize cleanup afterwards, I use scotch tape and medical tape (it's nice and pliable). Time for the gradient! Paint stripes of your chosen colors on the sponge, making them overlap a bit, and gently roll the sponge over your nail to make the gradient. This might take some practice to get a smooth result! 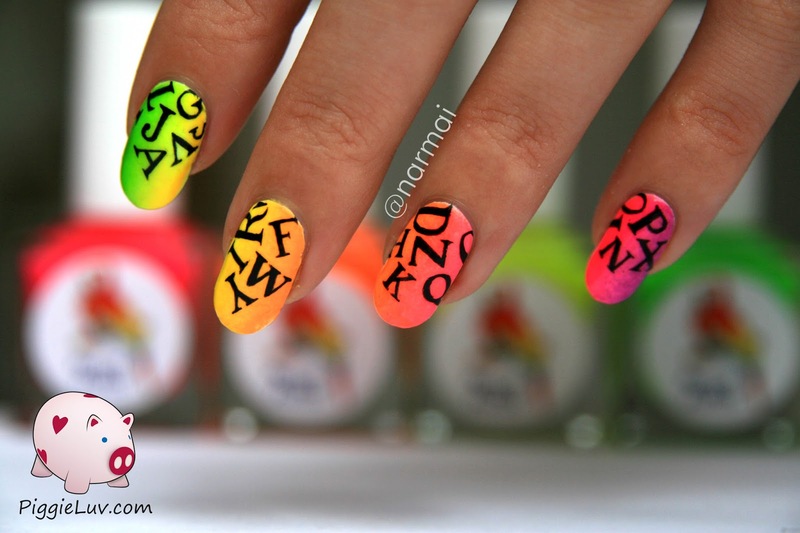 When you've achieved a nice look, remove the tape and put top coat on your gradient nails. This is the best part, my sincerest apologies for the parts that are out of focus. I had to use a different camera that I'm not used to. This also means that I had a different setup and I had to look past the freaking tripod that was in front of my face, so the art turned out shaky and wibbly wobbly. I recorded it THREE TIMES and then went with the first version of it. But okay! Take some black acrylic paint and paint your letters. Just choose your letters by general shape, stick round letters in big open spaces and thin letters in between two others. When you think it looks good, top coat and you're done! 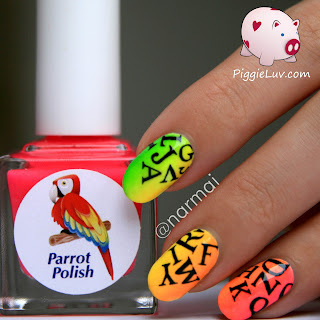 I received Parrot Polish Glow Hot Lips, Glow Tonic, Glow Mr. Yuk & Glow Blaze as a press sample to make nail art with. Opinions expressed are 100% my own and not influenced in any way other than the quality of the product itself.